Toom is now providing their consumers with access to next generation 3D production. Customers can directly order 3D prints or upload a 2D file that will be modeled for them by a professional 3D service. In a few clicks, 3D orders can be placed on the platform to be picked up on the next visit to Toom! Toom, a leading German hardware store chain, has decided to use the world’s leading eCommerce platform for 3D printing to power their step into Industry 4.0. 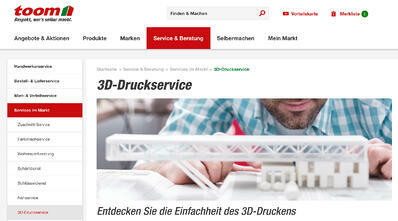 The solution is among the first consumer-oriented 3D printing solutions to be offered by a German store chain. The solution from 3YOURMIND is seamlessly integrated into Toom’s website to make 3D printing part of their customer’s next home improvement project. As part of their mission to “Respect the ones who do it themselves” (Respekt, wer’s selber macht), Toom is offering access to professional 3D printing as part of a modern toolset. Their customers can now produce replacement parts for broken objects or customize individual designs for their next home project. Even for novices to 3D design, Toom and 3YOURMIND are providing their customers with a tool to upload a 2D file that can be turned into a professional 3D model, ready for production. It is as simple as choosing a location to install, measuring the dimensions, creating a sketch or photo, and submitting a request online. A customer can pick up the object along with additional tools on their next visit to Toom. One of the most common problems in home repair is a broken part from a discontinued machine or piece of furniture. Previously, only dedicated “home repair experts” had enough expertise to fix these objects, even if they had a high sentimental value for their owners. There could be no real customization of the objects in home repair with the exception of adjusting the length of the wood. Toom and 3YOURMIND have given customers access to 3D printing to make sure that those problems are no longer barriers. The process is so simple that no previous 3D expertise is required. Anyone can simply upload a (3D or 2D) file, adjust the model’s size in the user friendly interface, choose a material, and submit the order. The customer can choose between having their print delivered to their home, or picking it up at their local Toom store free of charge. This service enables smaller businesses and contractors to generate individualized solutions from professional 3D producers at a fraction of the cost. For instance, you can 3D print special merchandising for customers or order a custom 3D design in exactly the material and quantity you need. Individuals can add a 3D print of their company’s logo in steel outside the office or produce custom architectural elements inside their office. 3D Printing is already integrated into the production of every major industry, from automotive to aerospace. In these industries, it enables the cost-effective production of unique designs. Now, Toom is extending this technology to home improvement consumers, opening the door for them to create customized designs adapted to their individual needs. 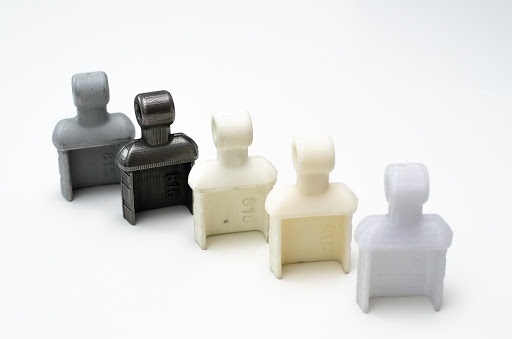 Toom’s professional 3D printing will be available in five different high quality materials, including metal (Steel 420ss), ceramic (Porcelain), and plastic (Alumide, ABS and Polyamide). You can already experience the process directly on Toom’s website. With over 330 stores in its portfolio (toom, B1 Discount Baumarkt and Klee Garten-Center), 15,100 employees and a gross turnover of 2.6 billion euros, toom ranks among the leading suppliers of the German DIY store industry. The company belongs to REWE Group, which is one of the leading trade and tourism groups in Germany and Europe. Altogether 330.000 colleagues work in 19 European countries for their customers. In 2016 REWE Group generated a total external turnover of around 54 billion euros. 3YOURMIND develops industrial 3D printing software platforms for Industry 4.0 workflows. Our enterprise solution is already being used by DAX 30 companies and forward thinking businesses around the world. From our offices in Germany, Poland and the USA, we are optimizing production processes for industrial 3D printing to drive the adoption of this technology for businesses worldwide. The 3D design-to-production platform has already been recognized with prestigious awards including the 2016 German Innovation Award.